Articles and posts about carriage doors. 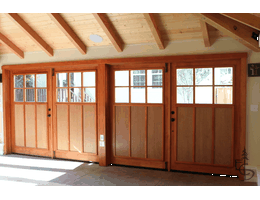 When renovating or building a new home, many homeowners are choosing carriage or swinging garage doors. In the past, homeowners had no garages to provide shelter for their automobiles; they actually lived in carriage homes, which is why the first carriage door was created. The top reason why many homeowners choose this type of garage door is because it provides a distinct, traditional style. However, a carriage garage door provides quite a few important benefits. The overhead tracks inside of a garage can be very unsightly. These tracks are intrusive for families that wish to turn their garage area into a family friendly environment; such as a rec room, theater room, gym, office or studio. Swinging garage doors can be used to eliminate the ugly overhead garage door tracks, and they will make it much easier to convert the garage into whatever space you want it to be. 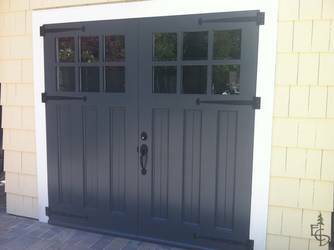 Another benefit to having a carriage door installed for your garage is the design potential. 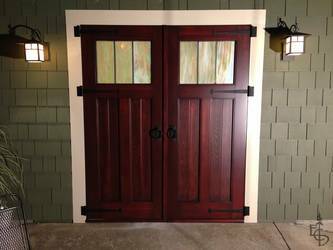 A carriage door can be a powerful focal point for both modern and traditional homes. 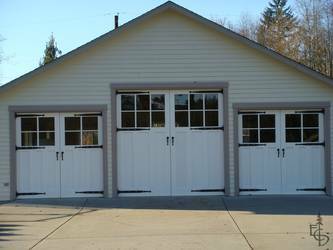 With a carriage garage door, homeowners have the ability to make the door unique, and it can be customized with a style that is very personal. A few of the top design options are vertical slats, cross buck and panel patterns. Window options for carriage doors are almost limitless. Homeowners can customize both the configuration and shape of their carriage door windows, which allows for the creation of a door that is truly unique and beautiful. Swinging garage doors operate like any entry door, but they can also be made for sliding applications like on many barns. Other options like handles, knockers and hinges can be customized. With so many design options available, the carriage garage door of your dreams is waiting for you; tell us about your project and find out how swinging garage doors would benefit you. Thanks you and you company for building these beautiful doors they are gorgeous the project is about complete and I wanted to recognize your work. If you need a reference in NJ feel free to use me. We got the doors this afternoon and got them uncrated. WOW, are they beautiful! Quite a work of art!!! We are excited to get them stained and hung! They will make quite a statement. ... Thank you for creating such a quality product! The doors are absolutely gorgeous. I cannot believe the amount of care that is put into making them AND packaging them for shipment. The are truly a work of art and I am excited to get them installed. ... Thanks again for everything, you guys are amazing. ©2005 - 2019 Evergreen Carriage Doors, LLC., All rights reserved.